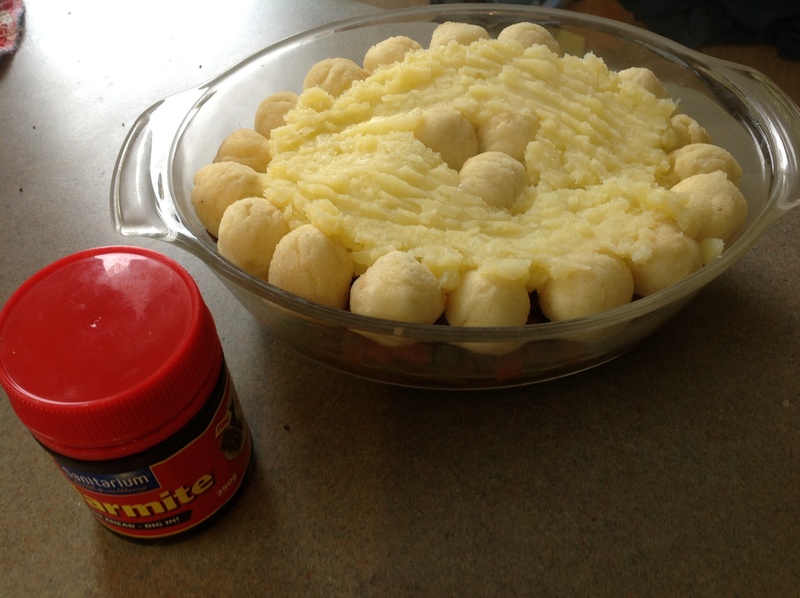 Day #6 – Shepherd’s Pie. With Marmite. Stop it. | Have kids, they said. It'll be fun, they said. 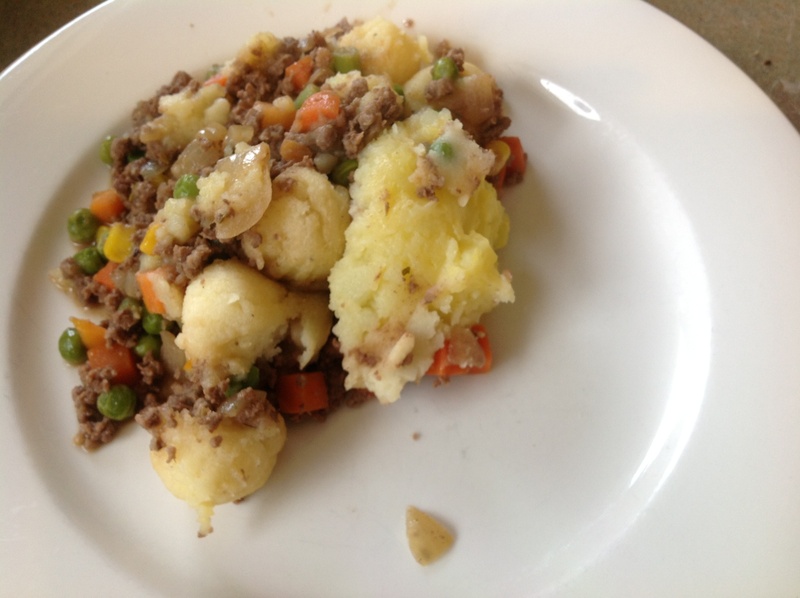 Day #6 – Shepherd’s Pie. With Marmite. Stop it. This evening, as I was preparing this meal amidst the usual chaos that is our house at 5pm, I was thinking about this blog and my “30 Days Without Takeaways” challenge. I came to the realisation that, as with many things, it often takes merely not being allowed to do something to stop oneself from doing it. In other words, I have challenged myself and am writing this blog as motivation to see the challenge through, and therefore I simply am not allowed to buy takeaways. And so, we are not. Today would have probably been an ideal fish and chip night – I spent a large part of the day working, Princess spent the day at a birthday party and Mr T is still under the weather. And, there is a cyclone looming, apparently. But, takeaways wasn’t even floated as an option. Because, quite simply, we are not allowed. And thus I made Shepherd’s Pie. This is another of the meals that Mr T mentioned when I asked him earlier in the week about meals from his childhood. Shepherd’s Pie (according to me, anyway) is just savoury mince topped with mashed potato. In some form. Mince meat is one of those grocery items you buy every week, regardless of meal plans. Because it is so versatile, so cheap and so easy to cook – we always have at least one or two lots of mince in the freezer. I didn’t use a recipe as such for this dish because, as with many mince dishes, it really is a case of throwing things at the frying pan and hoping they taste good. I mean, any mince is tastier than what my flatmate used to cook when I was flatting as an 18 year old – he aptly named it Salty Mince because it contained mince and salt. Only mince and salt. Which brings me to Marmite. Marmite? Shut. The. Front. Door. Are you crazy? Well, yes. But we already know that! 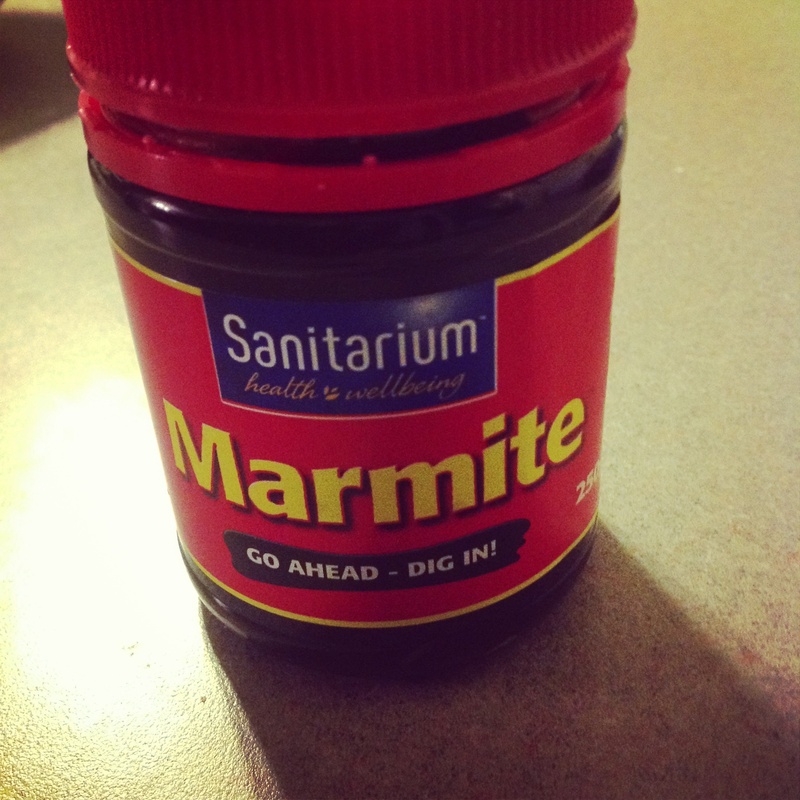 For those of you blog followers who don’t know what Marmite is, it is a black spread similar to the famed Australian Vegemite, only slightly sweeter. Very slightly. You either love it or you hate it. Oh, it is also very different to British Marmite, as we discovered when the NZ Marmite factory was closed for two very long years after the 2011 earthquake. 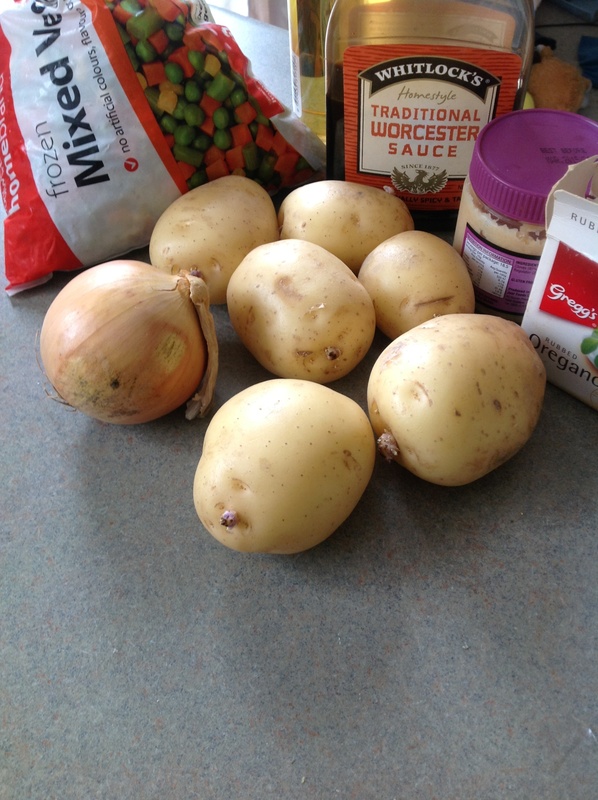 Potatoes (plus ingredients needed for mashing. We are dairy free due to BabyGirl’s allergy so we use margarine and olive oil to mash potatoes). So, the method is pretty simple – as I said earlier, I just throw things at the frying pan. Not literally. Most of the time. Chop the onion and cook with the garlic, add the mince and cook until it is brown. Add the Worcester sauce, mixed veges and stock. Cook some more. With the Marmite, I put about half a teaspoon of it into about 1/4 cup of boiling water and stirred until it had mostly dissolved, then added it to the mince mixture. Trust me, it’s delicious. While this is going on, peel and chop the potatoes then boil them until ready to mash. Mash potatoes. Once the mince mixture is cooked to your liking, put it into an oven-proof dish and top with pompoms or potatoes or whatever combination you have chosen. Top with cheese if ya’ll like. Put into the oven just until the potatoes are nice and crispy (about 10-15mins). Win. On a windy, stormy evening nothing is better than hot comfort food. Appearance wise, it looked like prison food but it tasted amazing. Smothered, of course, in tomato sauce. We didn’t need any side dishes because the pie itself is so jam packed with meat, potato and veges. There was enough left over that I can use it to create something for dinner tomorrow night. Here’s a question Mr T had for me today – are we allowed Takeaways if they are bought for us by someone else? Hmmm, I’m not sure. Food for thought! Your challenge sounds good. Making your own is healthier and often cheaper. The pictures look delicious, making me hungry. If you did use minced lamb- sorry my mistake. At the end of the day though doesn’t really matter what it’s called as long as it is nutritious and tastes good, and the kids don’t spit it back out. ( My niece is good for trying new foods but will then literally spit them out with a disapproving look on her face if she doesn’t like it – meaning having to find where the food landed then clean it up lol).